DISCLAIMER: I received this product for free from MomsMeet to use and post my honest opinions. Compensation for this post was provided and this page may contain affiliate links. Like many people, I like the new year to get off to a healthy start! I choose healthier foods, make exercise a priority, take my vitamins, and try to get enough sleep each night. But like many moms, I often struggle with eating balanced meals, because my big family is very busy and often on the go! Lunch is my biggest struggle. It's just easier to grab a healthy snack like a piece of fruit, cut vegetables, or string cheese, but I know that meal isn't very balanced. I try to avoid frozen convenience meals, because they aren't very healthy. Now there's a delicious, fast, and HEALTHY option: Alpha Foods Burritos! Alpha Foods offers convenient clean-label meals that are 100% plant-based, free of animal products, and loaded with protein, veggies, and flavorful seasonings. The delicious burritos are cholesterol free and non-GMO. They are clean-label and heart-healthy! They are convenient, and can be eaten easily on the go! Each burrito provides a healthy, balanced meal. They contain clean, quality ingredients. They contain 11 grams of protein! The burritos are free of GMOs, cholesterol, hormones, corn syrup, artificial preservatives, and all animal products. They promote a healthier diet. They support support a more sustainable environment and benefit animal welfare! 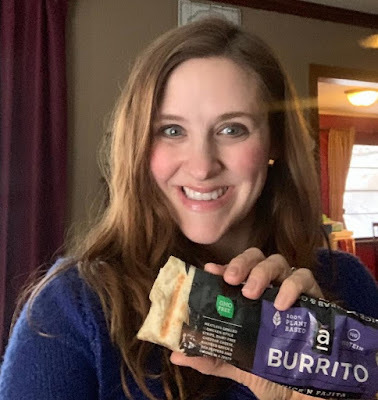 Alpha Burritos are available at Kroger, Walmart, Publix, Wegmans, Fairway Market, Sprouts Farmers Market, Fry’s Food Stores, Safeway, Shaws, Albertsons, Ralphs, Fred Meyer, Harris Teeter, King Soopers, QFC, Dillons, City Market, Giant, and more. You can find them in the frozen foods section in the healthy options aisle. Use the store locator to find a store near you. The stores that sold Alpha Burritos near us only had two varieties of the burritos available: Chick'n Fajita and Philly Sandwich. Although I would love to be able to try the other two varieties, I was very pleased with those two flavors. 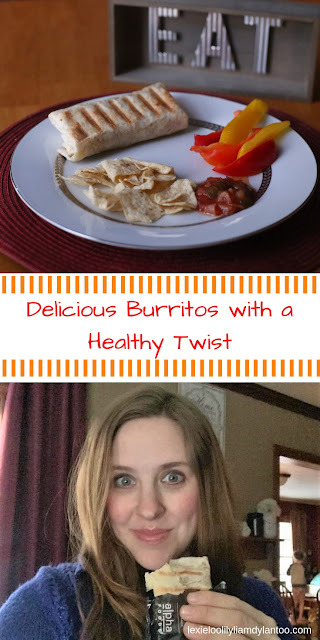 Keep in mind that I have daily morning sickness and food aversions, but I actually liked these burritos! The Chick'n Fajita flavor was a bit too spicy for me, but Dylan loved it. The milder flavor of the Philly Sandwich was delicious, and I could easily taste the delicious vegetables that were inside of it! I ended up purchasing that flavor again for myself. I don't eat a lot of meat, but I wasn't sure how my family would feel about the meat alternatives. To be perfectly honest, I couldn't even tell that the burritos were meatless. I didn't tell my family that they were meatless, and they had absolutely NO idea! 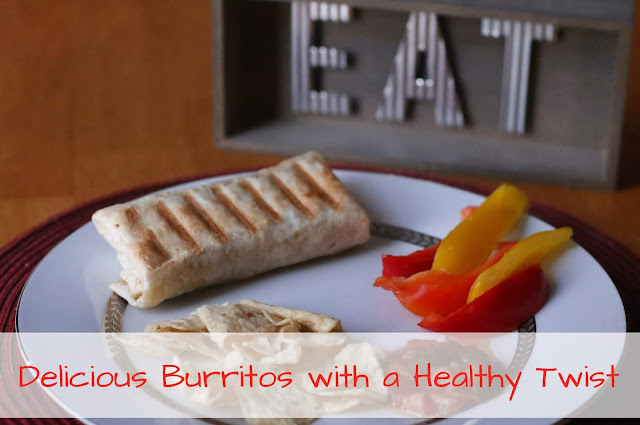 Alpha Burritos are PERFECT for an on-the-go lunch or an easy, healthy sit-down meal. They can be cooked in the oven or heated up quickly in the microwave within the wrapper or on a plate for 30 seconds. For an extra-special touch, I like to place the burritos on our beloved panini maker for a minute or two. It makes the flour tortilla extra crispy! I typically serve the burritos with sweet pepper strips, tortilla chips, and salsa! They are a hit with my family! 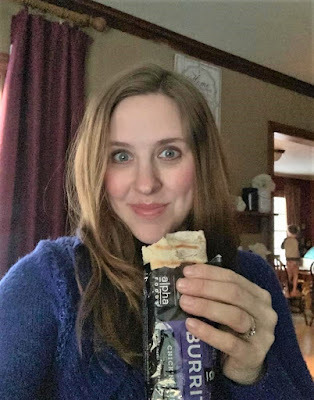 I'm giving away 4 FREE product vouchers to 4 of my readers so you can try Alpha Burritos for yourself! If you would like to try this product, please leave me a comment on this post telling me why you want to try Alpha Burritos and which flavor you would choose! I will be randomly choosing 4 comments on Wednesday, January 30th, and emailing the winners to get their addresses for the vouchers. And this, my friends, is how I eat most of my lunches! Notice the pants-less little dude stealing my food in the background. It's a good thing he's cute! They definitely look like a good on the go meal! I would love to try these because as a busy mom, it's so hard to make time for a healthy, yet substantial meal for myself. The idea of a delicious meal with 11g of protein that cooks in 30 seconds is like a dream come true, lol. I'm torn between the Mexicali and the Chicken Fajita. The Alpha Burritos sound interesting, I'm always looking for a healthy option for those nights when there is no time to fix a meal. Going off your description, I would probably go for the Chick'n Fajita Burrito since spicy is my thing! Oh me! Me! I would try the Chick'n Fajita! I don't eat a lot of meat either, so trying to find meat alternatives can prove itself to be extremely difficult at times! The fact that you can stomach these with all day morning sickness says something, too! I would love to try them as I am usually on the go at lunch time and these would be perfect! Also trying to eat less meat so I'm looking for meatless meals!